On a mild March 30, 2003 the eagerly anticipated Toronto Four Seasons bottle show had arrived. Yet I found myself in the mud early that morning looking for my first digging finds of the year. Hey I can do both, just have to keep your priorities in line. Not all the ground had thawed, but I could scrap away along the shallow periphery of the dump. The water saturated soil made my shovel feel like a set of bar bells. When the mud clings to the shovel, only half will drop off making for a very inefficient tiring digging experience. An hour later I had cleared enough ground to see where I left off from last year. Just as I remembered, more no name amber turn mould blob top alcohol bottles and a ton of amber flasks. I did keep an aqua flask with Ayer-on the bottom. Well it was time to clean up and go to the bottle show now that the dampness was getting to me, but first I had to pull out this milk can top to see if anything was behind it. Tearing away the milk can top only exposed more frozen ground, but what was interesting was a metal tag barely attached to the milk can lid. I could see writing but could not make out what it said, nor could club members I showed it to at the bottle show. I put the metal tag in my chemical solution bucket and the result was great. I then buffed it up with Brasso until it shined. 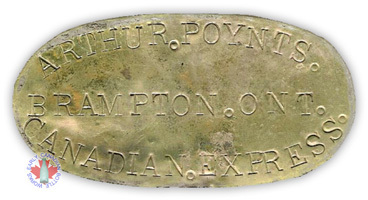 It reads “Arthur Poynts Canadian Express Brampton Ont.”. I’m speculating Mr. Poynts labelled his hardware when delivering milk and other products to clients. Buy coincidence Darren had just purchased a “bird’s eye view circa 1908 post card” that showed the store front canopy in downtown Brampton. Digging in the Brampton dump in 2003 was not always successful. The deepest section was not producing the oldest items anymore, not to mention it took the spring and early summer before the water levels dropped. When the water was gone the above ground was now very hard and to dig a foot or two at the garbage layer, meant digging 6hrs of hard cap. Seeing how this was my closest digging spot I persisted anyways. Some of these dark holes contained enough mosquitoes to choke on. I wonder if I’m resistant to West Nile Virus yet. Darren’s old hole was not producing anymore by the end of last year. I thought I would cut the roof off his tunnel and try at the very back of it. Now I know why he gave up on it. Their seemed to be only a thin ash layer, with very little glass. Some weeks later when I returned to investigate some collapsed portions of the hole I discovered a large blue aqua master ink had fell out and had been exposed for the taking all that time. I have not been able to find any information on what appears to be a very old master ink embossed “William A Davis Boston Mass U.S.A.” I have noticed that what type of bottle I find at the beginning of the year will then dominate through out the year. 2003 was a good year for inks, and I kept a total of 12 ink bottles, (just at the Brampton dump alone) in cobalt, aqua & pottery. Next time I returned to the Brampton dump was in late April and I concentrated on the same spot where I had found the brass tag. I dug a beautiful “Chas. Wilson” Toronto aqua embossed squirrel crown top. I also kept a “O’Keefe Toronto (light aqua/crown), “Corson’s” perfume (clear) and an odd half round tile marked “Amer Asso of Mfrs 99 Warren st N.Y.” on the inside (one person has suggested it was a military stamping tool), Here is a list of the remaining items found: a ceramic “bath tub” with gold trim for a doll house, a couple of small simple pottery flower pots, Aylmer canning Co (light aqua/screw top), a very nice fluid beef bottle “Bovril Cordial (amber with B-on back), “T Symington & Co Edinburgh” (aqua/anchor symbol on bottom), Carbonol Necessary as soap” (clear), “This is majors rubber cement majors cement co New York U.S.A.”, (clear) “Mum mfg Co Phila Pa” (milk glass), “F Stearns & Co”-on bottom of amber bottle, “Sanitol trade mark best for the teeth” (clear), “Catarrho zone N.C. Polson & Co Kingston Ont” (clear), “Chamberlains Couch Remedy Chamberlain MED Co Des Moines & Toronto” (clear), Dr Chase’s syrup linseed & turpentine Edmanson Bates & Co” (clear), “E.B. Shuttleworth Chem Coy Limited Toronto” (Cobalt ground lip screw top 13.5cm), “Griffith’s Methol Liniment” (clear), “Howarth’s Carminative mixture” (clear), “Scott’s Emulsion cod liver oil with lime & soda” (aqua/fisherman with cod-on bottom), “Slocums Coltsfoot Expectorant” (aqua), a tea cup, with “Bovril” in three shields in gold trim, “E. Anthony New York” (clear), and an Ottawa Pharmacist bottle “Weldon J Graham” (clear). The best bottle I found at this location is a one of kind Brampton pharmacist bottle embossed “C. Stork & Son Brampton” (clear/9cm). I felt I had exhausted this area so I returned to the north end of the dump, where the walls of an old hole had collapsed after the spring thaw. In the collapsed material I found a perfect condition soap dish with “Royal Ironstone China Mellor Taylor & Co England”-on the bottom, a broken tooth brush made of bone marked “red cross Hygienic” and a bedroom dresser dish for tooth brush or combs. This was attractively embossed with grapes & leafs in cream white with “W.& E. Corn Bursier Staffordshire England, Imperial Ironstone China” with lion, unicorn and royal crest –on bottom. What amazed me the most was I had the matching lid with handle that I dug years earlier at the other end of the dump. Never throw away those lids folks. When I had time to seriously re-dig this hole I was disappointed to find my first broken clear “Beaver” and clear “Bee hive” fruit jars. The “crown” Pt (clear) and “Improved Imperial” Qt (aqua) came out intact (figures eh!) The rest of my keepers before I gave up on this spot include two sizes of “Maclaren’s Imperial Cheese with lids in milk glass, no marking brown pottery spice bottle, “Campana’s Italian Balm” (clear), and some doll heads. Doll parts often turn up when digging and I display them for their bizarre appearance. Now it was time to return to the deepest part of the dump. With my rubber boots on I re-entered a 12 foot hole and tried my hardest to shovel the mud as far out of the hole as possible. Talk about humidity on a hot summer’s day! As it turns out, my finds were few and the shear task at hand to great and possibly dangerous to continue. I salvaged a “Clark bros Toronto” Hutchison soda (aqua/C-on bottom), “Scvereign Perfumes limited Toronto” (aqua) “Bovril limited 4oz & 2oz (older yellow amber variants), two crude aqua vials, and “D & O Co”- on bottom cobalt bottle. I was seeking a new spot to dig and I decided to try beside a white bark less dead tree. The old tree roots gave me a hell of a time and the hole itself deceived me because there was 3 feet of ash alone before you reached the garbage layer, making for another 8 foot hole. That day when I reached bottom I found my first foot warmer, a very large (33cm by 17cm) and marked “T Eaton Drug Co. Limited Toronto Doulton’s Improved Foot Warmer Lambeth Pottery London.” Although the stopper was missing and it was cracked, it still was visually interesting. My next attempt in this spot involved some tunnelling, which yielded more mustard crocks, “Rowat & Co Worcester sauce” (aqua), “Absorbine $2.00 per bottle MFC by W.F. Younge P.D.F. Springfield Mass U.S.A.” (amber), a very nice two tone cream & light brown jug (with handle/no markings/tampered bottom.) I also found an old (1867-70) “Kerry Bros & Crathern Fluid Magnesia” from Toronto in aqua. I had not found a milk bottle yet that year, so my focus now turned to a spot I new was just choked with broken milk bottles. What was the outcome? Just more broken milk bottles. 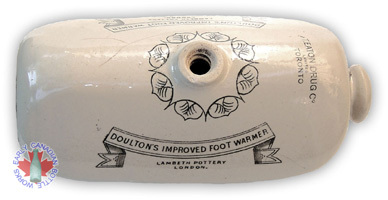 However I did find another older style “Cummer & Son Hamilton Ont” (aqua/quart), which Darren ended up with. I retrieved from this spot a “O’Keefe Toronto” quart (green/crown lip), a butter dish “Mellor Taylor & Co England”-on bottom, “Stower’s pure pickles” (aqua/trade mark brick tower inside a S), “J.P. Taylor Park 1903 Queen & Dowling” (clear/Toronto pharmacist bottle), a nice serving bottle with etched wheat flowers and cut indent design & flared lip (clear), and my first stamped brick “Ramsay” (light sandy colour). In the late spring a wind storm had passed through the dump and shore enough another tree came down (four toppled over in 2002, but not where any signs of dump seem to be) and this time it was on top of the dump. The roots & trunk of the tree ripped open a gapping hole two feet wide and five feet deep. I used a flash light to see if any bottles were visible. I could only see some broken bricks and I figured I might try this spot when I got tired of the other holes. Early September turned out to be the time to give it a try and as luck would have it I found a bowling pin style soda “Allan’s Montreal” (aqua/applied crown top) this encouraged me to completely open up this slit in the ground. I dug what I thought was going to be a marked pottery jug, but it turned out to be just a nice old tan jug complete with handle. In my many digs in this spot I found more pottery items such as “Andrew Wilson Toronto” clay pipe, brown tiger whiskey jug and dark brown bowl shaped piece also from China. Other neat items include, a cream ceramic whistle blowing instrument or some kind of inhaler, a cream baby bottle lid debossed “Mather London Manchester”, another in purple writing that reads “Mathers new feeding bottle the Princess London & Manchester” and yet another in black writing “S. Mawson & Thompson London Noll & 12 Aldersgate St.” The rest of my finds include my first clear transparent “float bulb,” two applied crown beers “The O’Keefe Brewery Co of Toronto limited” in embossed script (amber & rarer yellow amber variant), and a small olive green applied crown “E & J Burke” with cat embossed on bottom. This location helped me double my salt & pepper shaker collection with the following: embossed flower vine design in milk glass, with ground lip screw top, a clear four sided ground lip screw top, a three piece mould clear shear top with indent design, a six sided clear ground lip screw top and a clear ground lip screw top with three engraved wheat flowers on the side. One last find made in that hole worth mentioning is two enamel signs on top of one another. The first was another “Ocean Accident and Guarantee” like last years so I gave it to Darren and an attractive white on blue background, “The Imperial Guarantee & Accident Insurance Co of Canada Head office Toronto”. Both signs were produced by Acton Burrows Co. Toronto. At the end of December warm weather had returned and stayed long enough to melt the snow and produce a green Christmas season. Taking advantage of this I dug in the least of the muddy spots and was rewarded with a bunch of dentist bottles (one with a tooth in it) that I already had and a couple of different style “Ames” (clear) that were new to my collection. I dug a nice “Murch The Prescription Druggist East Toronto” (80oz/clear), “olives Santa Maria CHB” (clear), a beer “Berghoff Fort Wayne, Ind” (aqua/crown), a perfect master ink in brown pottery stamped “Doulton Lambeth 54”, and a neat “Old Fashion Sugar Sticks 10c The T Eaton Co Limited Toronto and Winnipeg” (clear/screw top). If you are fortunate enough to have a location to dig, then you have cleared the first hurdle. I have dug for hours and at the end of the day, had pretty much nothing to take home, and on those days my rationale is I had a good physical work out that brought me closer to the bottles for the next dig. Fellow diggers know it’s the opportunity that drives our hope and energy in finding our next coveted treasure.